It is rare to hear a UN discussion on youth that include a message of hope for their future. Often, UN agencies view youth as a problem or liability, whose large numbers in the developing world are a destabilizing force for society and the economy, and whose futures will be full of hardships. Last week, however, the Holy See Mission to the UN sponsored an event celebrating youth, the dignity of life, and the positive, essential contributions youth make to their individual and global communities. The organizers of the event also included the World Youth Parliament, Indenta Missionaries, The Path to Peace Foundation, and the Fernando Nenello Foundation and Institute for Integral Development. 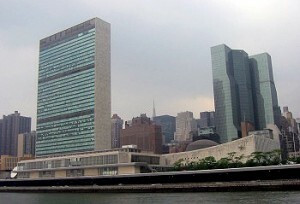 The even was part of the UN’s International Year for Youth programming. Speaking to a room of over 250 high-school and college aged youth, Archbishop Francis Chulikkatt encouraged them to always hold on to their “noble aspirations” and the enthusiasm that is a natural part of their young souls. He also reminded them that while youth is a time of hope and promise, there are many young people who bear the burden of poverty, illiteracy, and social uncertainty. He encouraged them all to maintain, even in the face of such uncertainties, a commitment to hope. In doing so, they would be a force for what is “true and good” in the modern world. Representatives from the Sisters of Life, a women’s religious order dedicating to upholding the value of life, reminded the young people that the experience of suffering does not change one’s dignity, and dared them to love in the face of trials and uncertainty- since the self-gift inherent in true love is the only force capable of truly changing humanity for the better. A panel of youth spoke about how respect for life’s dignity formed them as a person. Enduring the trials of being almost aborted, homeless, abused, given up for adoption, and dealing with mental illness and disabilities, these young people displayed the power of recognizing and living in accordance with human dignity. As such, they should serve as an inspiration to UN policy-makers who so often dismiss or discount youth’s resilience and capacity for making mature life decisions informed by the reality of their own inherent dignity and the dignity of those around them. They were a living example that young people can see beyond cheap pleasures and the lies of ideologies that have contempt for life, and chose to live for what is truly good – even if that choice entails sacrifice. Lauren is an Operations Associate at C-FAM's New York office. She is a recent graduate of Georgetown University's School of Foreign Service, where she majored in International Politics and studied French, Arabic, and Political Philosophy as well.